In light of the final exam, Jason Starr will have additional office hours on Monday, December 12th and Wednesday, December 14th from 9am-11am in Math 4-108. There will also be office hours on Tuesday. However an administrative meeting on Tuesday is yet to be scheduled, so I am not yet certain what hours I am available. According to the university's final exam schedule, our final exam will be Wednesday, December 14th, from 11:15 am to 1:45 pm in Physics P-117. Thanks to Robert Kozma for helping me realized that the write-up of the solution to Problem 1 on Problem Set 3 was wrong. It has now been corrected, and the solution set updated here. In light of Midterm 1, Jason Starr will have additional office hours on Monday, September 26th, 11am-12noon and Tuesday, September 27th, 8:30am-9:30am. There is a review sheet with practice problems for Midterm 1 posted here. Thanks to Kevin Sackel for pointing out there was a missing hypothesis from Problem 5 in the first draft of Problem Set 2. The statement of the problem has now been corrected. Course Description The description in the graduate bulletin: Ordinary differential equations; Banach and Hilbert spaces; inverse and implicit function theorems; Lebesque measure; general measures and integrals; measurable functions; convergence theorems for integrals. The description on the mathematics department webpage. 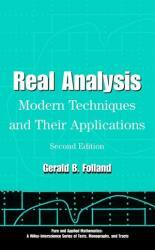 Gerald B. Folland, Real analysis: modern techniques and their applications, 2nd ed. available at the University Bookstore @ Stony Brook. A copy of the textbook will be on reserve in the Mathematics, Physics and Astronomy Library. Also you are encouraged to look for new or used copies of the book through other retailers or through your fellow graduate students. In addition to the required textbook above, for part of the course there will be a recommended textbook. Lynn H. Loomis, Shlomo Sternberg, Advanced calculus. Professor Sternberg has made an electronic copy of this book available on his webpage. Lecture is held Tuesdays and Thursdays, 9:50  11:10AM in Physics P117. The physics building is in the bottom left corner of C4 in the online campus map. It is directly across from the Math Tower when exiting on the P-Level. Office Hours Office hours are Tuesday and Thursday, 11:20AM  12:20PM, in the advising office in Math Tower P-143, and Thursday, 8:30AM  9:30AM, in Math Tower 4-108. The University Senate has authorized that the following required statements appear in all teaching syllabi on the Stony Brook Campus. This information is also located on the Provost's website: http://www.stonybrook.edu/commcms/provost/policies.shtml. Critical Incident Management Stony Brook University expects students to respect the rights, privileges, and property of other people. Faculty are required to report to the Office of University Community Standards any disruptive behavior that interrupts their ability to teach, compromises the safety of the learning environment, or inhibits students' ability to learn. Faculty in the HSC Schools and the School of Medicine are required to follow their school-specific procedures. Further information about most academic matters can be found in the Undergraduate Bulletin, the Undergraduate Class Schedule, and the Faculty-Employee Handbook.